It is world known that Sri Lanka is a traveler’s paradise which bestows meanderingly rushing rivers, sprawling hills, emerald fields and a never ending stretches of virgin beaches. The tropical and marine beauty that Sri Lanka comprises is something which makes it among the top destinations that are admired for the best holiday experience. Presently Sri Lanka is at peak in terms of tourism in India with bestowing the best of everything including breathtaking natural splendor with plentiful attractions in the form of exquisite churches, enchanting temples, Buddhist shrines, ancient fortifications etc. The exotic charm of the place with enigmatic beaches at the backdrop attracts more population and being culturally strong acts as an add-on. With being listed among the most beautiful islands, Sri Lanka offers amazing water based activities and adventurous water sports which makes it a perfect holiday destination. 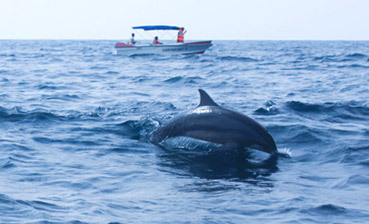 One of the prime water based activity in Sri Lanka includes Whale Watching. It is the most eminent water activity and most loved too. A large amount of population from all over the globe visits this tropical island to witness the glory of the largest mammal present in the ocean. Since time immemorial the place is eminent for exploring the whale life. The best region in island for spotting these glamorous mammals is Mirissa. It has the most accurate environmental conditions that these largest present mammal in world needs to be alive. Therefore, most of the blue whales are spotted here. It is also believed to be a place closest to where these giant blue whales are inhabited. Mirissa not only comprises breathtaking natural splendor but is also widely acclaimed for having five types of whales namely blue whale, bryde's whale, sperm whale, killer whale and pilot whale. Apart from the whales, there are other species too like turtles, Blue fin tuna and flying fish but the most admired one remains the four types of dolphins namely spinner, bottlenose, striped and Risso's. Dondra Point, Trincomalee and Kalpitiya are other eminent regions in Sri Lanka which are famed primarily for spotting the glorious whales and the elegant dancing of the dolphins. The forever smiling dolphins of this island puts an imprint of their elegance on the soul of the each and every visitor. The dancing dolphins bewitch the onlookers. 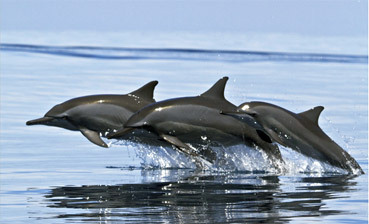 The enigmatic aura of these pretty dolphins doesn’t let people walk away from them. The mischievous blue whale, the largest present creature in the marine, gloriously glides past leaving people at the harbor in wonder. Witnessing the playful yet amazing actions of these elegant species makes it the most exciting water activity which one can have during their holidays in Sri Lanka.